A Right Or A Privilege? Detroit Residents Split Over Water Shut-Offs The city's been shutting off water to thousands of customers who aren't paying their bills. Some argue it's a violation of a basic human need; others say nonpayers are effectively stealing water. 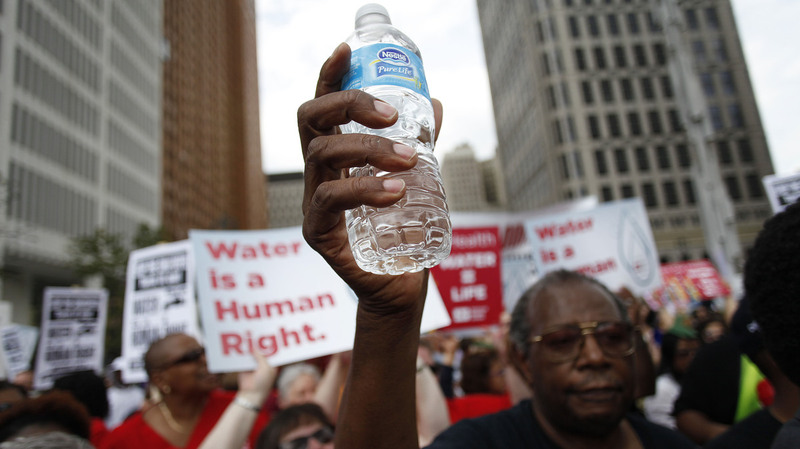 Demonstrators protest against the Detroit Water and Sewerage Department last month. Thousands of the city's customers are behind on their water payments. In Detroit, protests continue over the city's massive effort to shut off water to thousands of customers who aren't paying their bills. Activists call the move a violation of a basic human need, while city officials call it an economic reality. Detroit's Water and Sewerage Department has been accruing a massive debt for decades — in part because officials say there was only a token attempt to collect past-due bills. By this year, about half of all water customers were behind on payments, owing a combined $90 million. So officials here launched an aggressive campaign targeting back payments, using the time-honored utility tactic of shutting off water service until payment arrangements were made. Some Detroiters are split on the move. Along the city's busy Woodward Avenue, longtime residents like Clifford Durham say water customers should have known what was coming. "It's a shame that it's happening, but they had options and budget plans like, 10, 15 years ago," Durham says. "Tell 'em your situation. Don't wait 'til your bill is $300 or $400 and get a shut-off notice," he says. "The protesting that's gonna go on for the water I think is ridiculous." The sheer number of people shut off — 17,000 — has led to frequent demonstrations and some international attention. The United Nations declared it a human rights violation. Activists, a federal judge, even movie stars like actor Mark Ruffalo — who portrays the alter ego of The Hulk in the Avengers films — joined in what's truly become a cause celebre. "There's no reason that this city and this state, with all of its wealth, can't come up with some sort of a program to keep this water from being turned off. I mean, it's insane," Ruffalo said. City officials say they are setting up payment plans for residents, and add that more than half of those who had their water shut off subsequently paid their bills and had service quickly restored. But others have tried to block the shut-offs, pouring concrete over water mains tagged by the city with blue paint — a kind of scarlet letter indicating the pipes there should be closed. Tutorials have also spread on Facebook describing how to get water flowing again. Detroiter Nita O'Neal says it's relatively easy to find someone with the kind of long metal keys that open closed water valves — even though only city workers are supposed to have them. "People gonna turn that water back on. Somebody has a water key, trust me. You give 'em $5, you gonna get your water back on," O'Neal says. "People have to have shelter, food and water." Turning the water back on that way is, in fact, a crime — it's stealing water. But for families with little or no income, O'Neal says, the stakes are too high to worry about that. "You got babies that's probably not taking baths. That's opening up the door for protective services to come in, say that you are unfit parent," she says. "This is a game that they're playing, and it's a serious, dangerous game." City officials counter that water rates are going up in part because people game the system. Paying customers, they say, have to cover the costs for those not paying their bills. But Water and Sewerage Deputy Director Darryl Latimer says the department wants to cooperate with customers, even those who argue water should be a right, not a privilege. "I think water is a right. However, if all of our customers took that stand — that it's a human right and we're not gonna pay — then no one would have water," Latimer says. It remains very much an evolving situation in the city. The water and sewerage department recently began targeting past-due commercial and residential customers, then declared a two-week moratorium on all shut-offs. Detroit's emergency manager put Mayor Mike Duggan in charge of the formerly autonomous water system. But the department itself remains a bargaining chip in Detroit's ongoing bankruptcy proceedings. The city wants out of the water business and the debt it carries and is pushing to either regionalize or privatize the system.